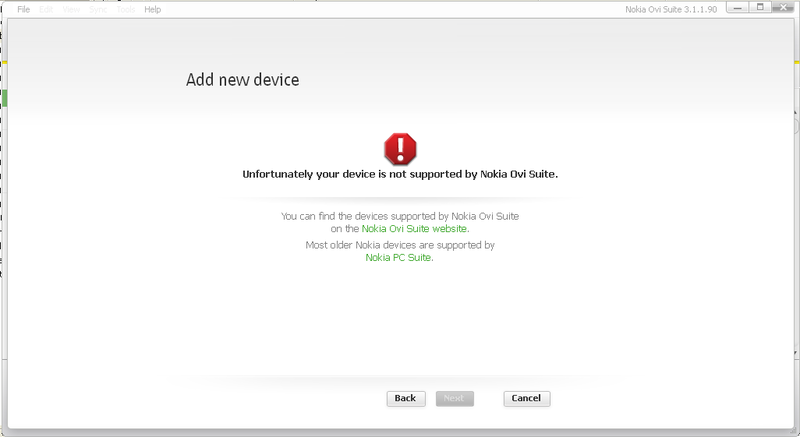 Currently if you have the latest Ovi Suite for Nokia, you will get something like this when you try to connect your N9. There has been some talk online that if you install a particular earlier Ovi Suite version, it will happily connect with the Nokia N9. Why that is the case, considering the N9 came out AFTER Ovi Suite 3.0.0.90? No idea but that's how it is. You can download the N9 compatible version of Ovi Suite at http://www.4shared.com/file/NEaBJnfo/Nokia_Ovi_Suite_300290.html. This is also possible connecting via bluetooth as well if your computer has bluetooth and you have activated it on the N9. Ovi Suite works now with Nokia N9!